I got a call a few days ago that Fletcher CT scan came back and that the lesion on his skull has NOT changed! Thank you, Jesus! Last Thursday TCC tested him for MRSA and he is now negative and no longer in an isolation unit! Fletcher has been MRSA positive for about 15 months. 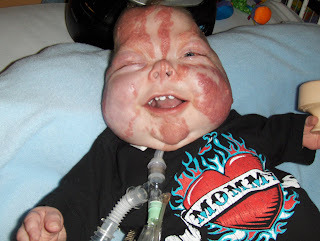 MRSA is what made him resistant to a lot of antibiotics it was in his trach and at one time it was in his ears. It also caused him to be in a unit with other MRSA kids and anyone who worked with him had to wear a gown and gloves. We are so grateful for this great news!